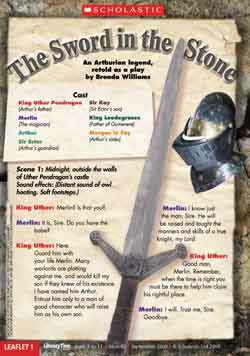 In Leaflet 1, Brenda Williams retells the famous Anglo-Saxon legend of ‘The Sword in the Stone’ in playscript format. The script has parts for seven main characters, making it perfect for group reading or performance. These Teachers’ Notes accompany the PRINT ONLY guided reading leaflet in Literacy Time PLUS Ages 9 to 11, September 2009. Allow children to scan the text. Establish that it is a play script and recap conventions of script writing in terms of layout and technical terms. If possible, read and/or watch some versions of the Arthurian legends and examples of adaptations of the sword in the stone legend.